Be the first to share your favorite memory, photo or story of Alyne. This memorial page is dedicated for family, friends and future generations to celebrate the life of their loved one. 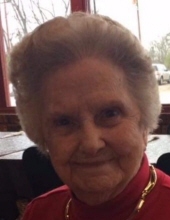 Alyne Henrie Strickland, 94, of New Boston passed away Tuesday, January 15, 2019 at a Texarkana Hospital. Alyne was born February 14, 1924 in Malta, Texas to Louis H. and Juan Caughron Henrie. She was a retired Director of Food Service for New Boston General Hospital and a member of The Church of God of The Union Assembly in Texarkana, Texas. She was preceded in death by her parents; her husband, Coy Strickland, one son, James Larry Strickland; eight sisters; and 4 brothers. She is survived by one daughter-in-law, Marilyn Strickland of New Boston, Texas; four granddaughters and two grandsons-in-law, Leesa and Steve Barnhart of Garrison, Texas, Stephanie Worley of Garrison, Texas, Samantha and Jerry Caddenhead of Crockett, Texas, and Melissa Parry of Texarkana, Texas; one grandson, Justin Strickland of New Boston, Texas; eight great grandchildren, Trey Worley, Trevor Worley, Raelee Caddenhead, Caleb Caddenhead, Presley Parry, Ace Parry, Ashley Downing, and Alan Downing; 2 great-great grandchildren; and numerous other relatives and friends. Services will be 11:00 A.M. Saturday, January 19, 2019 at The Church of God of The Union Assembly in Texarkana, Texas with Pastor Darren Faulknor and Pastor Jesse Crider officiating. Interment will follow at Redwater Cemetery in Redwater, Texas. Visitation will be held 10:00 A.M. to 11:00 A.M. at The Church of God of The Union Assembly in Texarkana, Texas. The family would like to give special thanks to Gene Raney, Melba Pierce and Pam Camp. Memorials may be sent to The Church of God of The Union Assembly, 4981 US Hwy 59 South, Texarkana, TX 75501. To send flowers or a remembrance gift to the family of Alyne Henrie Strickland, please visit our Tribute Store. "Email Address" would like to share the life celebration of Alyne Henrie Strickland. Click on the "link" to go to share a favorite memory or leave a condolence message for the family.